We all like decorating our house for Christmas and we all hate (most of us, anyway) putting the decorations away for storage. From the long, way too long wires, to the bulbs that don’t work anymore and always need replacement, Christmas lights can be fun and infuriating, just as well. This is where laser lights come to the rescue. Apart from the fact they’re so energy efficient, laser lights bring so many good things to the table and it’s quite hard to say “no” when you need Christmas lights. • Covers up to 3900sq.ft. 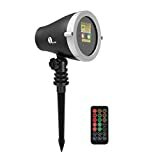 Affordable and very easy to install, the Goutoday Laser Lights Remote Outdoor&Indoor Projector Lights are a great way to prepare your garden or your home for the jolly holidays. 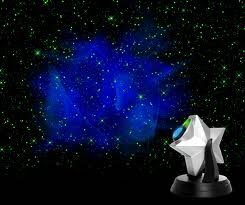 The projector includes thousands of red and green stars that may work together. They may also run separated by blinking spots or flickering, creating a beautiful décor on the outside of your home, lawns, patios and more. The red and green projector lamp may cover up to 2,100 sq.ft. from 25ft. you should use several sets in order to create a more impressive impact. The projector has a very good build and it’s IP65 waterproof grade. It comes with IP44 power adapter and you shouldn’t worry about some rain or snow damaging. The LED is high quality and it ensures low energy consumption, taking the long time use. You may insert it in the lawn or place it on the ground. You can also hang it in the roof, without needing a ladder. You may use the RF wireless remote control for selecting the operating modes. You may use the remote for controlling all the functions of the projector. The patterns are nice, the images are clear and the colors are bright. It presents an IPwaterproof grade for the projector and comes with IP44 power adapter. 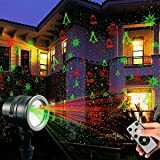 Nevertheless, as it’s well –made, affordable, easy to control and presents so nice combinations for the Christmas, the laser projector is one solid choice to have in mind. 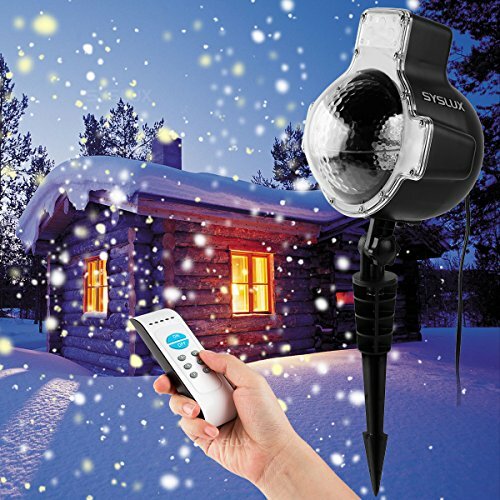 The wide covering range of the Syslux LED Snowfall Projector Lights is only one of the good things that it presents as the projector comes with a pretty long list of positive features. 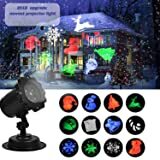 The projector lights are very bright and they have a rotating style, giving you the chance to bring a nice snow falling light over your house. The projector has a good build and may be safely used both indoor and outdoor. It’s IP65 waterproof rated and this means it can take some snow or rain, without putting it underwater or soaking it in the heavy rain though. 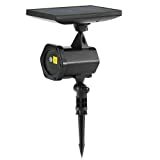 The waterproof safeguard makes the projector versatile and dependable for use when lighting the outdoors: house, fence or a nice garden. It presents a working temperature from -15 to 95 F degrees. The remote control makes the use easy peasy and not only the projector is easy to set it up, but it’s also easy to use. the wireless RF controller works from even 50ft. away and you may easily set different modes with it: Flash, strobe or normal. You may also speed up/down and set the projector light on 2/4/6 hours on, 22/10/18 hours off daily cycle. The versatility of the projector adds up and you may mount it using the base or the long spike for ground mounting. The 180degree adjustable projector head aims nicely, even from a far. The nice diversity of the rotating white spots, the pretty patterns make the projector a good option for so many situations, all year long. Nevertheless, for a fair price, you get a versatile, bright, well-made projector that may serve you all year long, no matter the occasion. 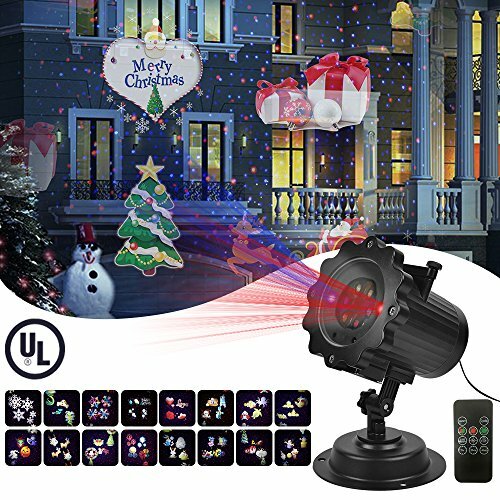 Light and nicely looking, the Christmas Lights Projector, Laser Lights Star Night Shower with RF Remote Controller Waterproof LED Projector is a sure buy for anyone. The projector comes with a metal shell and presents efficient heat dissipation, which expands its durability in time. You can choose from 3 different mounting options: ground mounting, wall mounting and tripod mounting. The star laser shower includes Single Red, Single Green, Red&green modes that you can select by remote. The pattern is moving, but you may also set it on simply stationary or select the moving speed. It comes with an automatic timer so you may set it to turn on at dusk and off at dawn. You may save some energy by choosing the light to turn on the same time every single day. The housing is IP65 waterproof, taking both rain and snow. It’s a high standard laser light. It comes with indoor base and outdoor plug. It’s easy to install and to select the patterns. 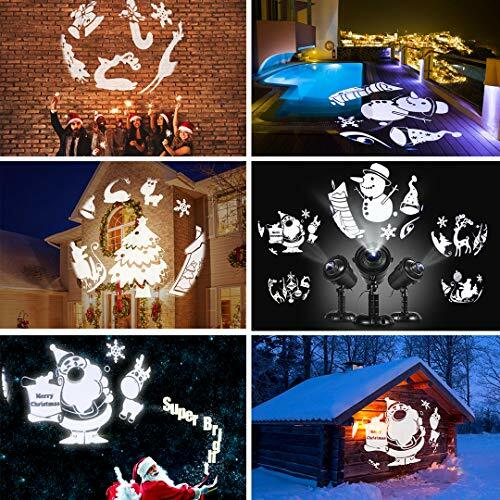 All in all, for a very good price, you get a nice, solid and easy to use laser projector that is going to create a nice Christmas décor inside and outside your house. 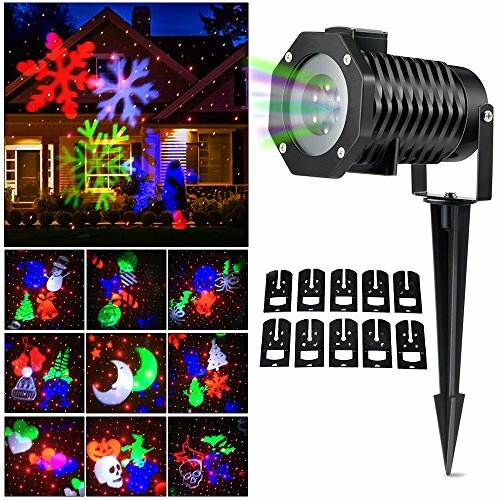 The CrazyLynX LED Projector Light with 16 Slides Outdoor/Indoor Landscape Projector is going to create a warm and pleasant decorative lighting scene for you garden or inside your house. 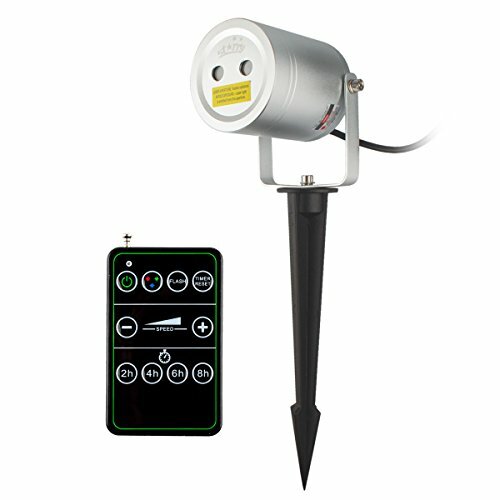 It’s very easy to install as it comes with ground spike and tripod as well. It features a weather-resistant cap which is going to protect it from the bad weather. The housing is IP65 waterproof rated. The projector comes with 32ft. long power cable that has a 270-degree rotation for easier handling. It may light up to 15ft from the projection surface. You may need to adjust the angle and the distance once the lights turn down, in order to get the best visual effect. The projector runs on automatic 6-hour on and has an automatic 18-hour off cycle. You may interrupt the timer cycle by turning the light off manually. The HD quality of the images, the various speeds and the strong build turn the projector into a wise investment for this year’s Christmas. 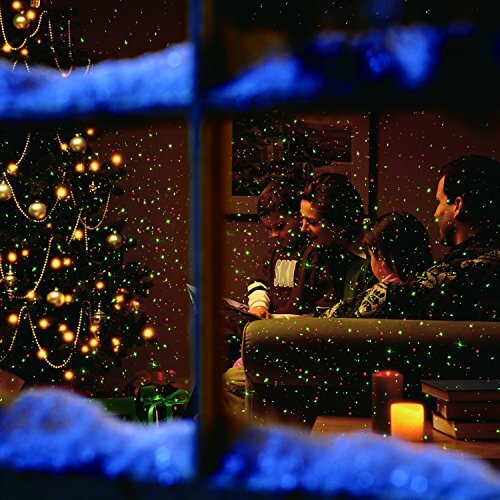 All things considered, the laser projector is dependable, easy to use and it’s able to give your home a Christmas feel. 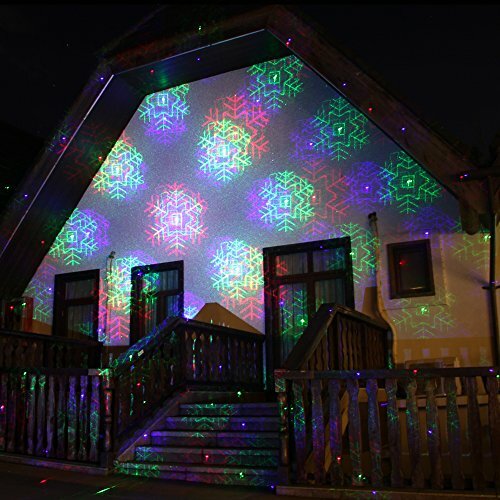 The Kuquce Slide Show Led Outdoor Projector Lights with Remote Decoration gives you no less than 16 multi-color patterns to choose from. It’s a versatile projector that you may use for Christmas, Halloween, Valentine’s day and so much more. The light projector takes both the indoor and outdoor use, presenting an IP65 waterproof grade. It features a weather-resistant housing and you may operate it from -30F degrees to 100F degrees. The projector light is made of plastic and ABS and comes with light casing and good power adapter. The built-in timer function is a nice addition and the laser light is going to automatically turn off after 6H. it’s going to turn on again after 18H. however, you may easily customize it and go with 2/4/6H cycle if you’d like. There are several patterns to choose from and the pictures are self-selected. You may easily control everything with the remote control, but it’s not omnibearing (you do need it to be toward the projection image or led screen). As long as you’re aware of its minor limitations, you should take the leap of faith and get the laser projector for this winter season. 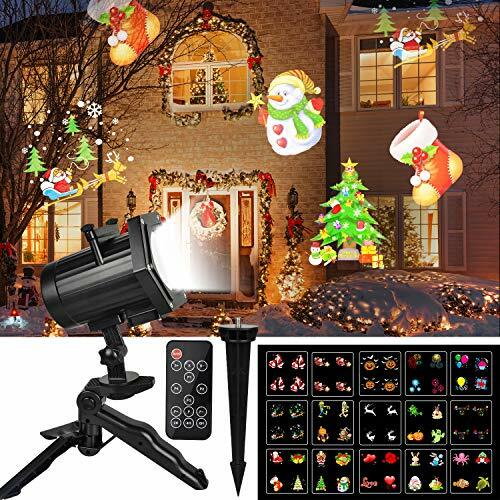 Try the newest version of LED projector with the UNIFUN 15 Patterns LED Projector Light Waterproof Dynamic Outdoor Christmas Lights. The auto-rotating dynamic project light is going to create a lovely show for your home, no matter the occasion. It contains 15 pieces’ replaceable slides (Santa Claus, Christmas tree, clown, snowman, Halloween skeleton, rabbit and more). You may use them on both interior and exterior walls, dance floors or landscapes for creating a pleasant atmosphere. The RF wireless remote control works from a nice distance and it’s easy to choose the projection mode, spinning speed and flash mode. The projector features a built-in timer. You can also go with 2, 4 or 6 hours’ cycle. The range is up to 30ft. and the led beads are high quality. The build is good and the projector has an IP65 waterproof rate. Installation is a breeze as the projector comes with round base and ground stake as well. The images are clear and the animations are really cool. 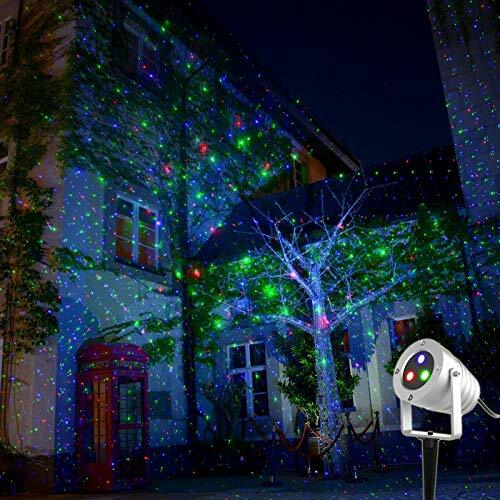 Regardless of the minor cons, the projector still stands as a versatile, reliable and easy to use laser projector that works both indoor and outdoor, no matter the holiday. 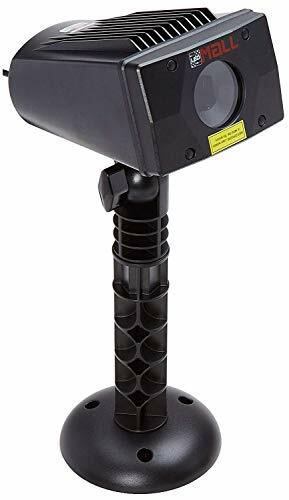 Well built and reliable, the Demeao Laser Lights with RF Remote Control is a lifesaver this Christmas, especially if your wallet is a bit empty from all that gift shopping. 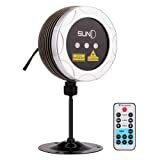 The projector gives nice, two color light effects and you may mount it anywhere, indoor or outdoor. The projector has in fact three mounting methods: wall mounting, tripod mounting, and ground mounting. The metal shell and the effective heat dissipation extend the lifespan of the projector and its IP65waterproof grade makes it rain and snow resistant as well. 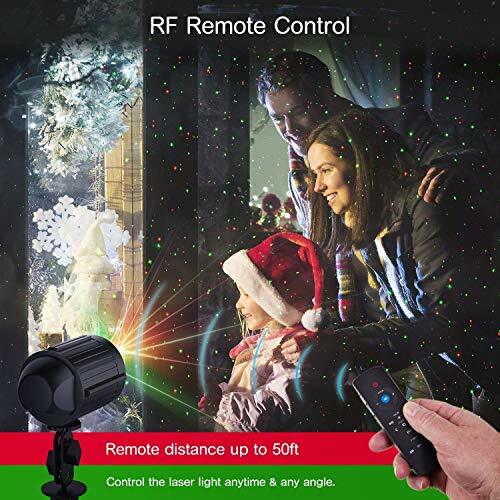 The RF remote control is useful and you may easily scroll through the various modes: single green, single red, red green. The pattern may be moving and you may also set the speed or have the lights in stationary mode. The build-in timer means you get also to set the projector on at dusk and off at dawn. You may also do it through the remote control, setting a time for the light to turn on every day. Apart from the minor problems, we still like the projector for its effects, build, mounting and, we have to admit, its very good price. 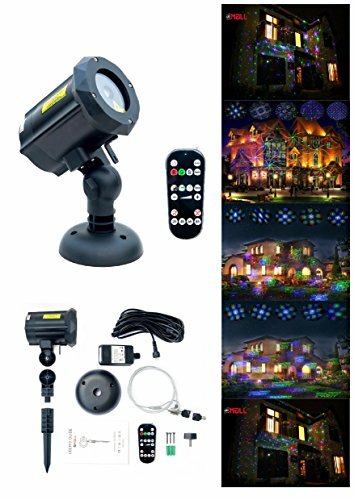 Easy to install and to control, the LED Christmas Light Projector, 3D Waterproof Landscape Spotlights with RF Remote Control are going to bring all the fun you were missing in your garden for Christmas. 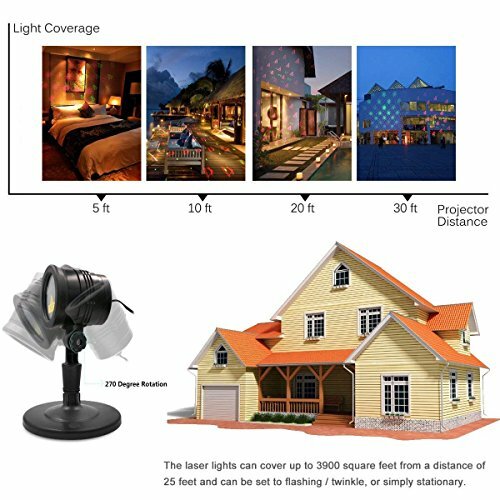 The light projector includes a 360degree rotation light which ensures a 3D spherical visual effects. 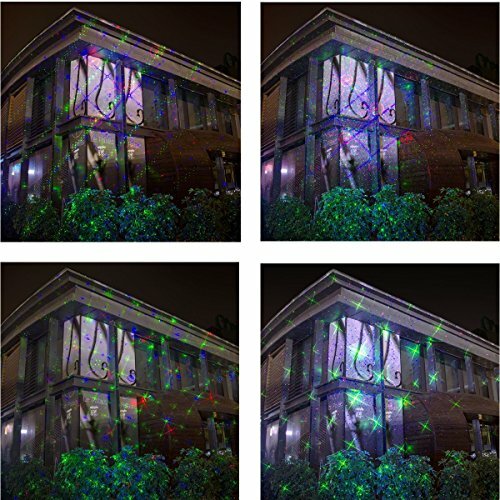 You may use the HD bright 3D lighting effects both inside and outside your house. The farther you place the projector, the clearer the images are going to be. In addition, the images are quite cute, cheering everyone around. The build of the projector is good and the main body is rated up to waterproof IP65. As for the adapter, it’s rated waterproof IP44. You can definitely use it outside without stressing about a rainy day. The projection lamp is made of good quality ABS material, so it’s able to take the use for quite some time. It takes the use from 5-86F degrees, presenting both cold and heat resistance. You may use the remote control for adjusting the brightness, the speed or the timing. There are 4 timing options, so you have plenty of settings. All in all, as it’s easy to install, to use and really affordable, the projector is a solid option for anyone this Christmas. 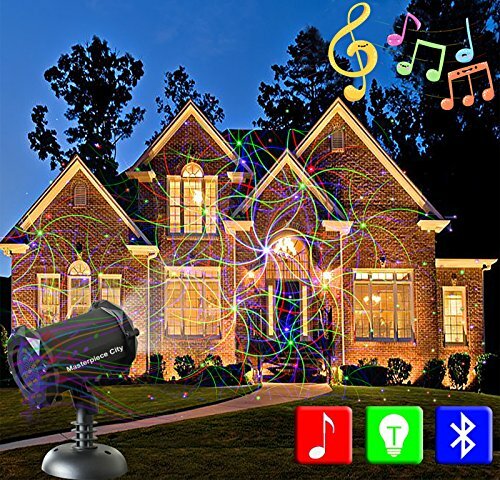 Very easy to install and offering you so many options to light up you residence, give it a go with the Starry Full Color Motion Laser Light Star Projector. 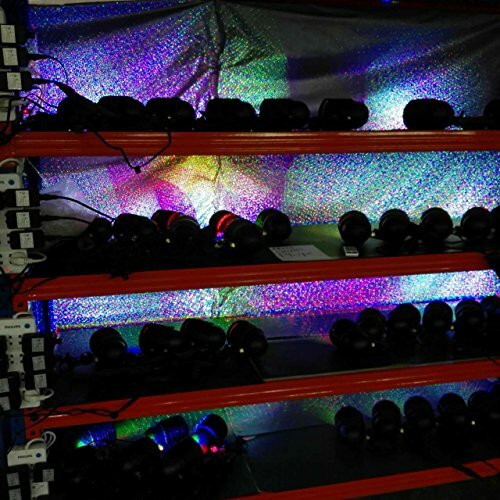 The laser projector is well made and FDA approved so you may safely use it for your pool, camping, wedding and all sorts of holidays, including Christmas. Here are the colors to choose from: green, teal, pink, white, blue, yellow, and white. The moving patterns are various and look nice: fade, twinkle, pulse or chasing and the speed is adjustable for a better decoration. The laser projector comes with 3 Auto Timer modes and you may press the 4/6 or 8H button to set the time when you want it to turn on automatically. Just that you know, the laser projector has a default time mode of 6 hours on and 18hours off. Don’t worry about using the projector outdoor as its IP65 casing make it safe on rain and snow. It works in temperatures ranging from 5 to 86F degrees. Additionally, the power adapter has an IP44 waterproof grade so it can take a splash. Let’s not forget about the intruders and tell you about the security hole that locks the laser light, minimizing risk for getting stolen. We also like the wide coverage of the laser projector: up to 1,600 sq.ft. from a 26ft. distance. 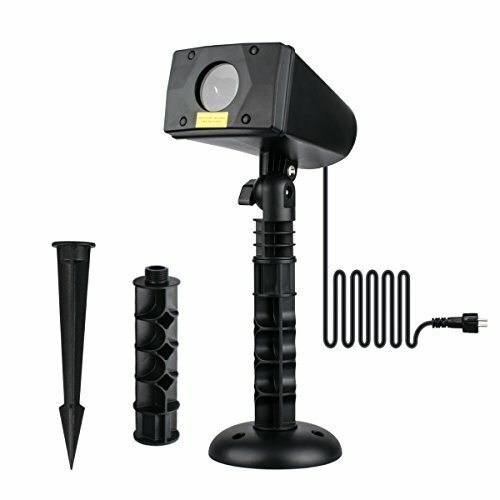 The laser projector comes with extension stakes to use if mounting outdoor. You may also use the base though when you want to use it indoor. The remote control is pretty user friendly and works from a nice distance. Regardless of the weaker points, we still think the laser projector is a versatile, durable and reliable option for anyone willing to pay the extra buck. 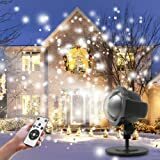 Give your house or your garden a bit of action this Christmas with the AOSTAR Christmas Laser Light Remote Control Waterproof LED Outdoor Motion Laser Light Projector. 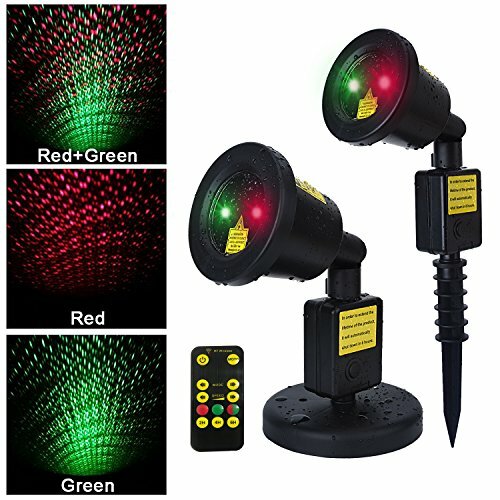 The dynamic laser light gives thousands of green and red stars that blink so nicely, creating an amazing atmosphere for your special occasions. The projector is weather resistant and waterproof, presenting an IP65 grade. It’s able to cover more than 3000 sq.ft. 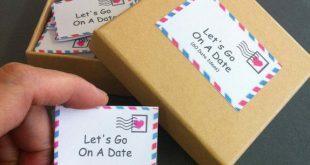 and you can use it not only for Christmas, but also for New Year, Valentine’s Day, wedding or other special occasions. It comes with a remote control so going through the various settings is going to be a breeze. There are several modes to choose from: Static red&green, red&green motion, green motion, static green, red motion, and static red. The projector is really easy to install- you simply plug it and play. It’s going to shut off automatically after 4 hours of lighting so that is saves energy and extends its durability in time. It comes with stake and base so you may use it both indoor and outdoor. You may adjust the angle up to 120 degrees. 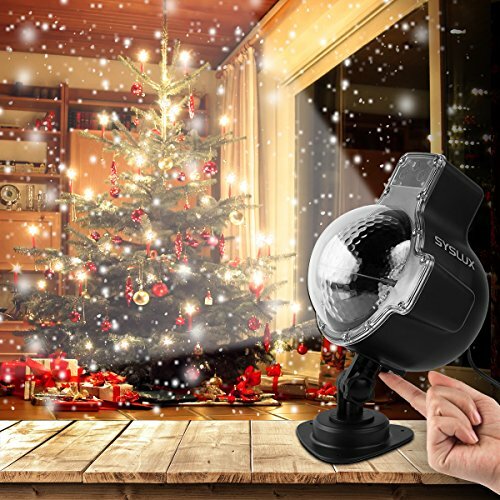 Regardless of the downsides, the light projector is still able to create a magical atmosphere for your Christmas or other special situations in your life. 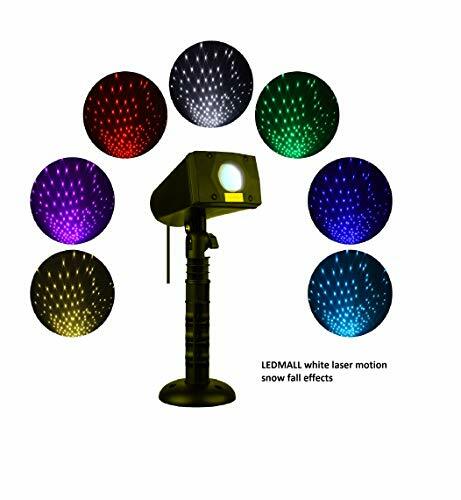 The motion snow fall effects and the 7 color of LedMAll® Motion Snow Fall Full Spectrum Star Effects 7 Color are its best assets and you should give it a go for this winter’s holidays. 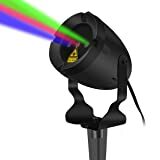 The projector combines red, green and blue and it’s the first semiconductor white laser that offers both motion and star effects. It uses LEDMALL advanced Optical Systems and the accurate power ratio control, forming nature’s 7colors and pure white. 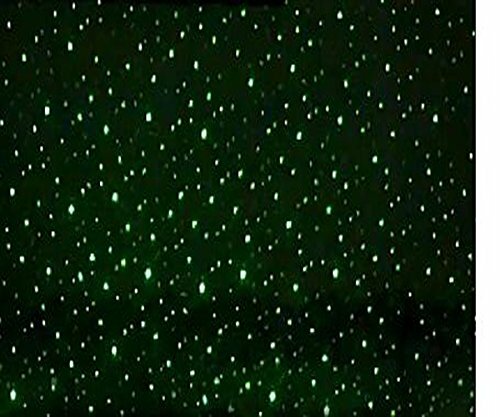 You’re going to see white, pink, teal, blue, yellow, green and rainfall motion Starry, Fading, Twinkle, Chasing but also some static effects modes. It’s a great option for the outdoor applications. It comes with speed control, and you may also choose from flash or static mode. The projector comes with indoor base stage and outdoor stake extension, for more versatility. It features timer settings: 2, 4, 6 and 8 hours durations, speed and moving control. The power cord is long and the projector has IP65 waterproof grade. Easy to install and to use, it’s going to be a good option for many out there. The good outweigh the bad so you shouldn’t sit on the fence when shopping. The more you’re paying for your laser projector, the more you may expect from it when it comes to its performances or build. 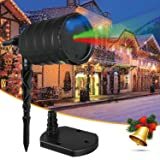 It’s the case of the Cheriee Laser Christmas Lights Outdoor Projector Light that isn’t going to let you down for a good amount of time. The laser projector stands out with its build and body as it’s made with high quality materials, handling well challenging weather conditions. It works even in snow, rain or intense sun. Its IP65 degree makes it functional even on a light rainy day. 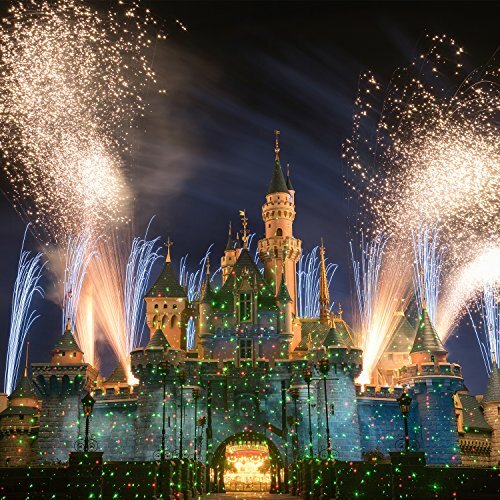 It uses laser holographic technology and covers more than 800 sq.ft., projecting up to 300ft. away. It displays thousands of green, red and blue star combination, but you may also try the red/green/blue stars static. 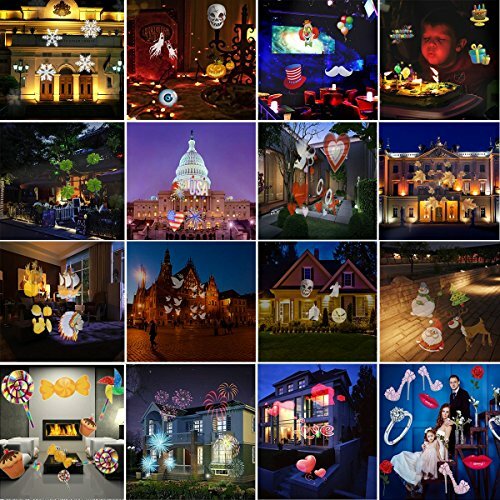 You may use the projector both indoor and outdoor, on any special occasion, not only on Christmas time. Its remote control is fast and responsive even from 49 ft. away. The power cord is 4.5ft. long and the projector works well. The projector is easy to install and energy efficient. Never minding the flaws, the projector is still a good investment into celebrating the winter holidays. 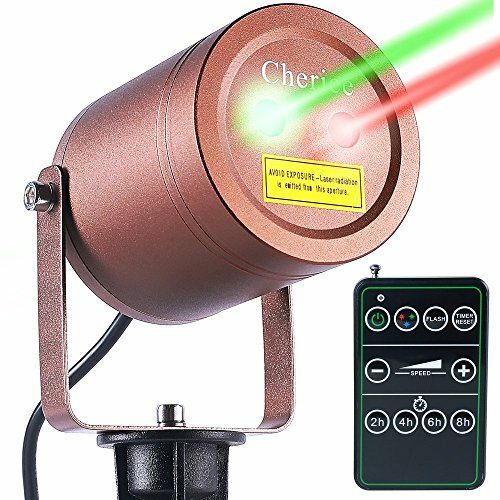 If you’re looking for a bright and cheerful laser projector for the winter holidays, put your money at stake with the Cheriee Laser Christmas Lights with RF Remote. The lights give single green and red displays, but you may also use the combination of the two colors. 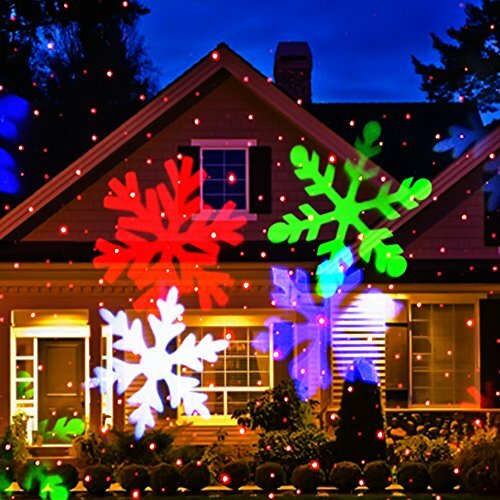 You mays set various patterns for the lights: flashing, rotates or simply Static. As the projector comes with a remote controls, you also get to set the flash and rotating speed according to your needs. You may choose from slow, medium, fast or static, for different atmosphere. The remote control is sensitive and fast and has an 8-15M range wireless power. 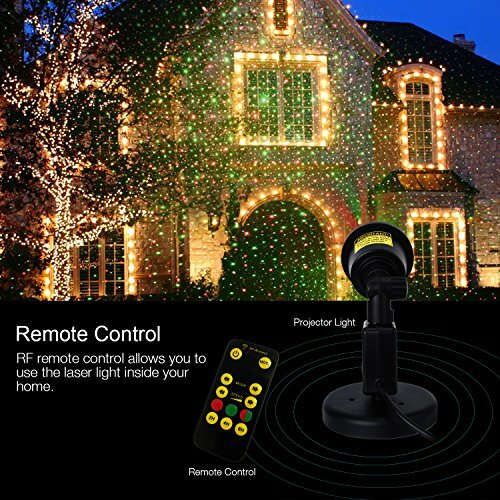 You may sync even 4 Laser Christmas lights with just one remote control. As for the lights, they may cover up to 5000sq.ft. , which is quite impressive. The lights are easy to use and they also come with an automatic timer. This means they turn on automatically at dusk and stop at dawn. Additionally, you may set a timing mode with the remote control so that the lights turn on at the same time every night and turn off automatically 2,4, 6 or 8 hours later. The build of the lights is great for the outdoor use. Made with aluminum housing case, the lights also present an IP65 waterproof grade, which means they also work in the snow. Well-made and versatile, the lights are worth every single penny. 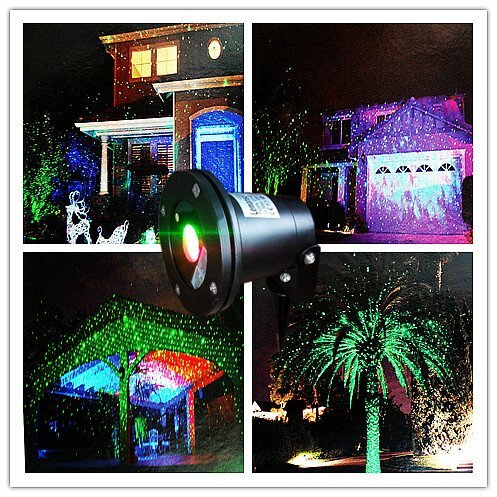 Festive and bright, the Imbeang 8 Pattern Garden Laser Light, Moving Red,Green and Blue Light is going to let everyone in your neighborhood know you’re ready for Christmas. 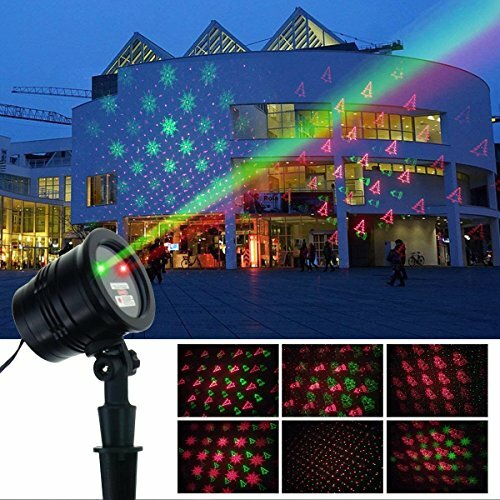 The laser projector gives you 8 patterns to use: moving green, blue and red light and 3 speed models (static, slow and fast). The patterns may change quite fast and there are more than 1000+ to decorate your home in a colorful and bright way. The smart RF controller saves you the trouble of going outside for setting the projector. You may set the colors and the speed using the remote control. The projector covers a pretty wide area and the power cable is 20ft. long. The aluminum metal case and the IP65 waterproof grade make it for the outdoor use, but you may confidently use it indoor as well. Additionally, the projector handles the extreme temperatures also. Let’s not forget about the security lock that prevents it from being stolen by some intruder. For the multiple good things though, don’t be afraid to put your money on this laser projector this year. 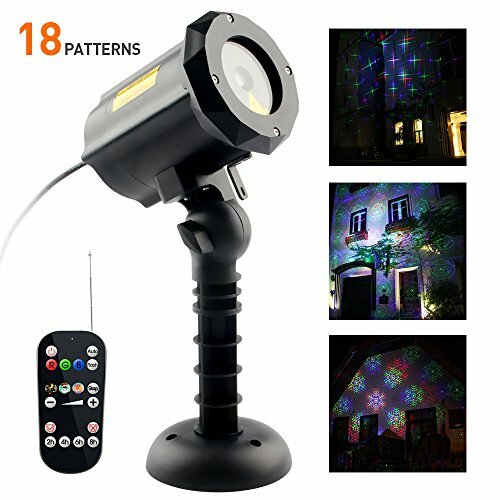 When it comes to the Imbeang 18 Patterns Garden Laser Light in 3 Modes, many can’t really decide why do you like it better: for the lights, the quality or the price? 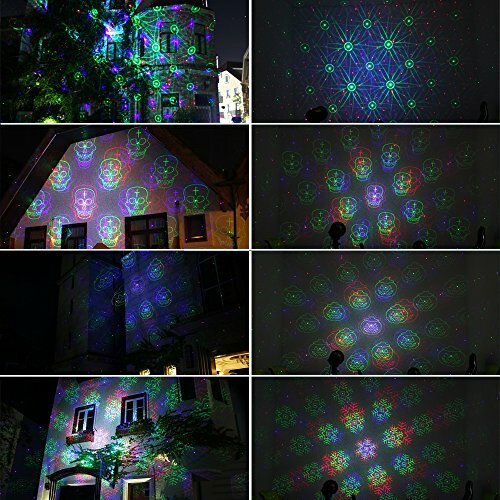 The laser projector gives you no less than 18 patterns in 3 modes and each model has 6 patterns. 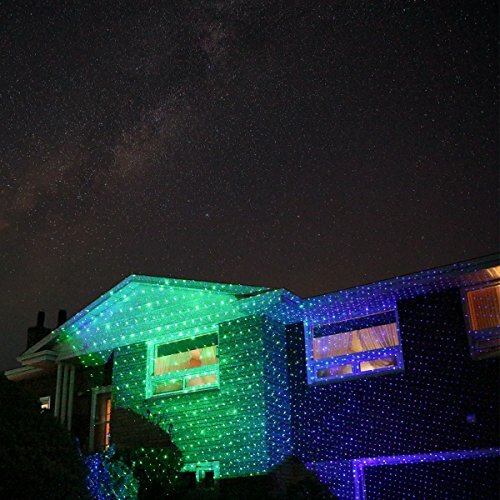 The patterns are dynamic and the laser has 1000+ blinking spots to decorate your home on celebrations. The smart RF remote controller helps you get easy through the 3 models and 18 patterns. You may also select the speed and the timer function. The laser projector has a wide coverage and its power cable is 20ft. long. It also comes with security lock so no intruder can leave your home with the projector. Presenting an IP65 waterproof grade and an aluminum metal case, the projector handles very well the extreme temperatures and the snowy or rainy weather. All in all, for the amazing lighting effects and great build, this laser projector isn’t going to let you down for years to come. 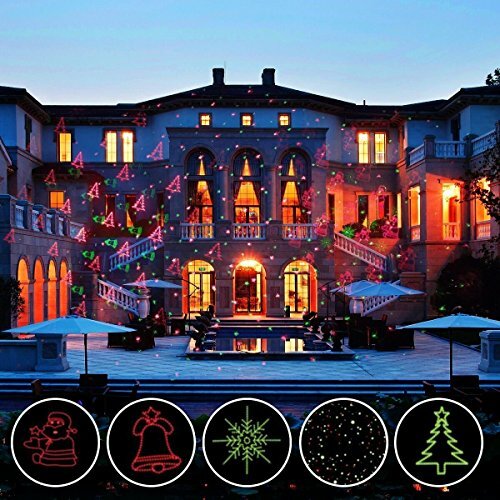 Covering more than 3000sq.ft and including more than 1000+ points of moving red, green and blue laser beams, Adecorty R G & B Laser Lights Star Show Waterproof Landscape is going to create a lovely and whimsical atmosphere for your home. 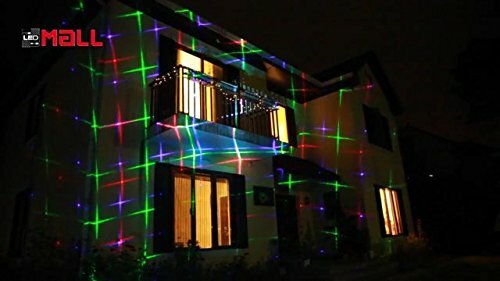 There are colors to choose from and different patterns laser lights that are going to create a magical vibe for your home. 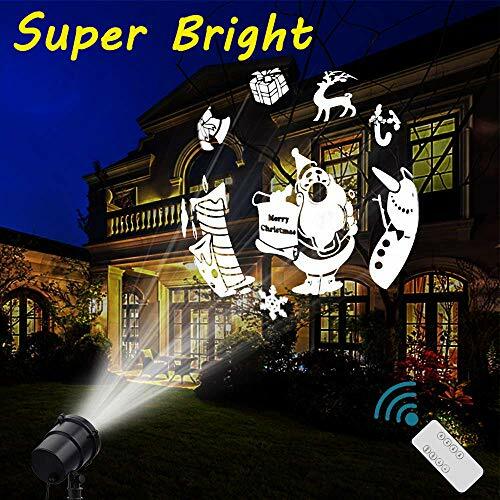 The sparkling star and dazzling effects are going to lighten your house, lawn and garden. The laser lights are good quality and safe to use. The projector has an IP65 waterproof grade and it’s made with long lasting aluminum material. It takes the cold and rainy weather, but you may also use it inside. 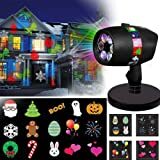 You may use the projector for Christmas, but also on Halloween, thanksgiving, New Year and other holiday events. It comes with a remote controller and an automatic timer so you may choose from various colors and color combinations. It features a 24 hours’ circulatory timer setting, speed option and several modes. The remote control works up to 50ft. distance. The power cable is 16ft. long which gives you plenty of freedom of movement. 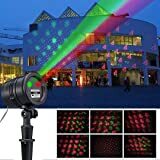 Even though the laser projector isn’t all roses and rainbows, it still stands as a solid and nice option to have in mind for the winter holidays. 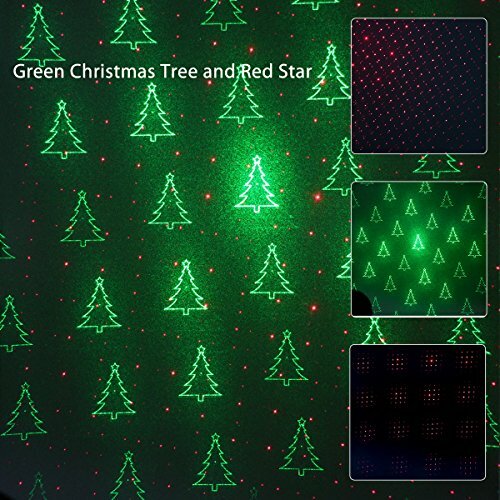 Giving precise and sharp lights, the 1byone Magical Laser Light with Green Christmas Tree and Red Star Patterns are a great option on Christmas on years to come. The lights are designed and made for the indoor and outdoor use, being versatile and reliable. You simply place them in the ground outside or on your floor inside and enjoy the show. They are able to cover up to 2,100 sq. ft. from a distance of 20ft and come with many useful features. The lights turn on/off automatically depending on the light intensity, but also present an Automatic Timers function. This means they automatically turn off after 6H and on after 18H. The lights have 2 colors, 2 patterns and go through 10 lighting effects. They have one all-purpose single button control and the built-in light sensor is sensitive and fast. The lights rotate and move, creating nice lighting effects for your outdoors. We also like the lights as they have an adjustable angle function. Precise, sharp and easy to operate, the lights are a great choice for the winter holidays. 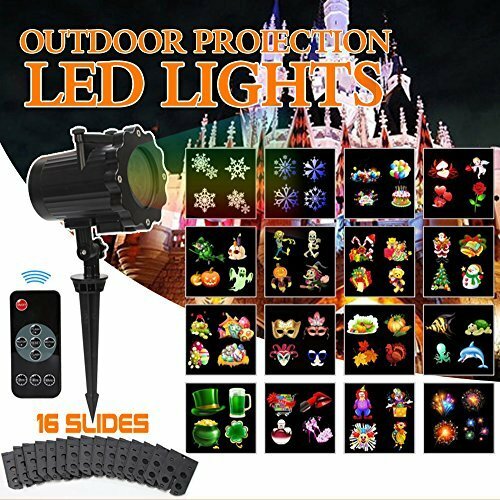 Take a leap of faith and put your money at stake with the PinPle Projector Lights Garden Laser Light with 16 Patterns. 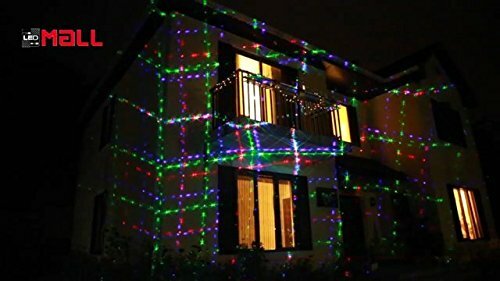 The lights present no less then 16-pattern slides with red and blue laser. They are great for many occasions, not only for Christmas as they display not only Christmas patterns, but also Halloween, Birthday themes and so on. 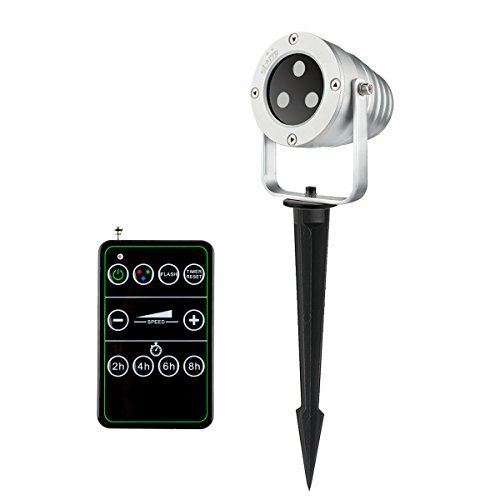 The construction of the lights makes them reliable to use both indoor and outdoor with lawn stake and base. They present an IP65 waterproof grade, taking a few splashes. The remote control eases up the use, whereas the automatic built-in timer saves you the trouble of constantly remembering when to turn on/off the lights. You may also set an working time for the lights or simply set them to turn on/off at dusk/dawn. The power cable is 16.4 ft. long and the lights have a 180-degree rotation for better setting. The lights are heavy duty and have a compact body. Additionally, they fold flat for easier storage over the year. 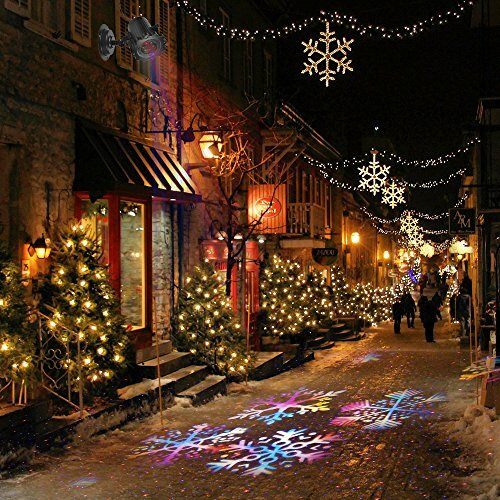 Easy to use and great with their patterns, the lights are a great investment to make for your Christmas. If you would like to add some blue into your Christmas decorations this year, don’t hesitate to get these lights. They give you green and blue light, which is both nice and refreshing also. The lights take less than 2 minutes to install and are waterproof. They give you several patterns to choose from. The patterns are moving and you can set the moving mode or the stationary one simply using the remote. The lights also come with automatic timers so this is great when it comes to energy saving. You can set the lights to turn on the same time each day or night and turn off again 2, 4, 6, 8 hours later. 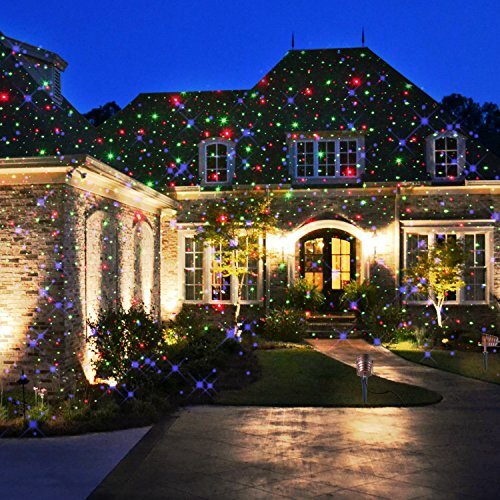 The lights may cover almost 3900 square feet, 25 feet away and you can set several modes: twinkle, simple or stationary. The lights have a good built and the price is good for the quality you get. You can place the lights anywhere you like, with no stress about tangling in wires or challenges to reach the hard places. You don’t need to hang it or a ladder to climb. Each unit is independent so you can have as many as you like. The more you are willing to pay for your Christmas lights, the better quality you get and these lights are the proof of that. The lights are for the heavy duty use and the high quality of the aluminum stake is a reason for it. 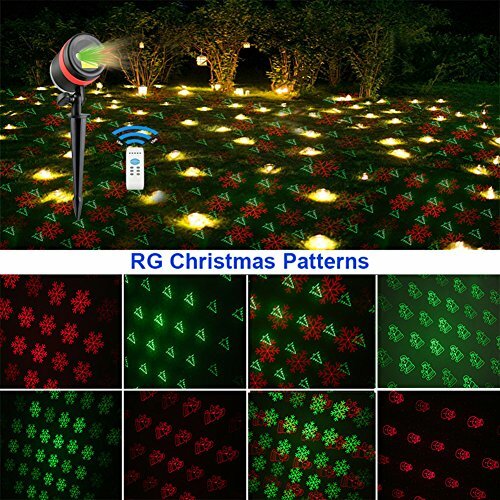 The laser lights are waterproof and may be used in cold temperatures also. the lights are red, green, blue and you can set various combinations of these colors for the lights. You can choose moving pattern or the stationary mode with the remote control. You can set the lights to turn on at dawn/dusk and having it turn off 2, 4, 6 or 8 hours later. The lights are efficient on energy saving also. You can cover almost 3900 square feet from 25 feet away and the lights may be used on Christmas, but on various occasions just as well. The lights are easy to install, wherever you want. The lights are made of aluminum, just as the stake and are long lasting. 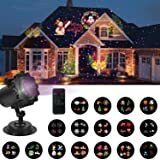 As they give you so many color combinations, various modes to choose from, the lights make a reliable and fun option for many Christmases, not just for this year. 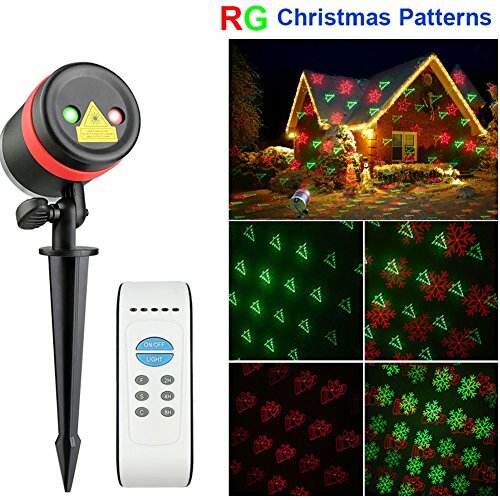 There are more than 1000 moving laser points for the Outdoor Christmas Projector Garden Laser Lights with Remote Control 3 Color Red Green Blue and that should be more than enough for creating a lovely feel in your garden this Christmas. The light projector is weatherproof and comes with a IP65 waterproof grade, taking the rain and snow just fine. It’s made to take temperatures ranging between -22 up to 104F degrees. 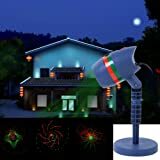 You may easily mount it in your garden and plug it for enjoying the magical spectacle of laser lights. 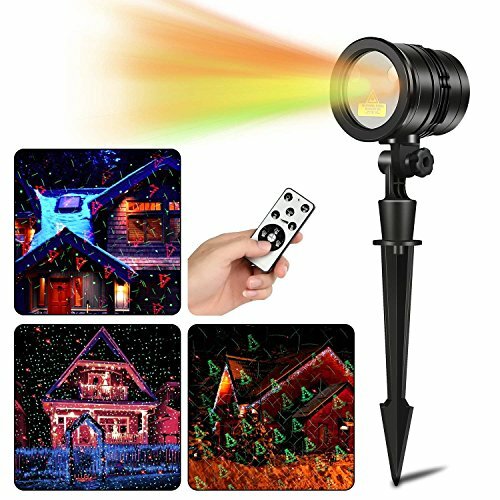 The projector comes with a remote control and you may choose between moving, single, dual, firefly or triple combination of colors. It’s able to cover an area up to 3900sq.ft. The build is sturdy and the colors are bright. You may use it on many occasions, not only on Christmas. 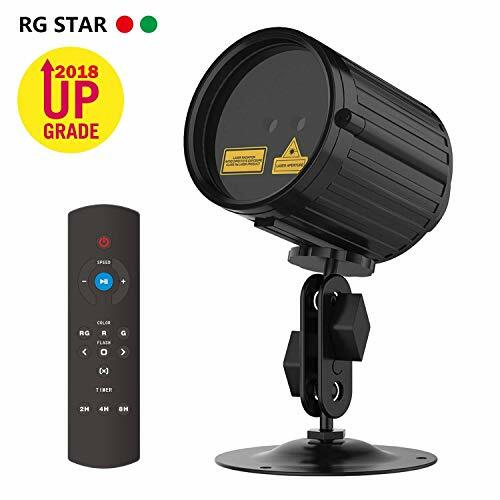 Easy to install and to use, presenting a durability feel to the build and offering a nice show of lights, the projector is worth every single penny. It covers up to 3900 sq.ft. 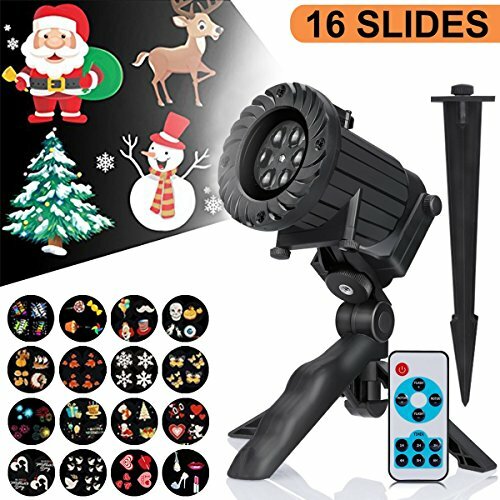 Having said that, we still believe that the projector is going to create a wonderful feel in your garden, Christmas or not. 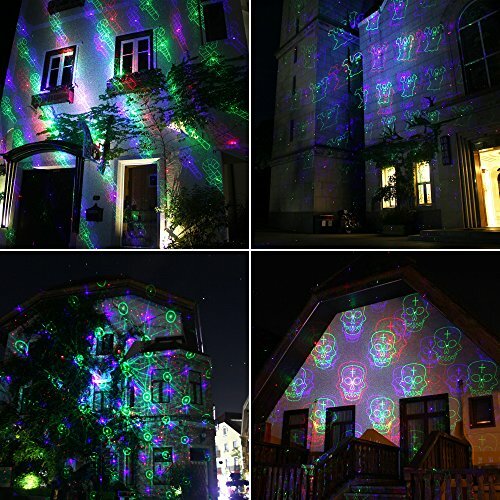 The latest model of the Laser Twilight Star Projector is here 2018 Laser Twilight Light Show Hologram Projector ‘UPGRADED MODEL’ and you should try it for sure. 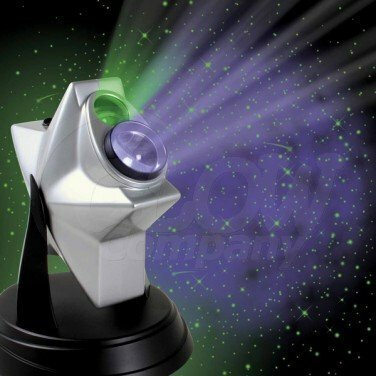 The laser projector presents clear green animated star display which is going to look amazing in any room. The stars are slowly rotating in time, similar to the motion of the Earth. It’s a Class II laser product, turning any room into an animated Universe. It also displays a blue cloud, for a romantic feel. You can turn it on/off, or dim it exactly how you want. The laser projector comes with 2hour automatic shut off timer so it preserves its performances for a longer time. Should anything doesn’t work as planned, the laser is easy to replace. It runs pretty quiet and the images are great. Even if the laser projector is only for the indoor use, it’s still a solid option to consider as it sure creates a whimsical feel in any room. 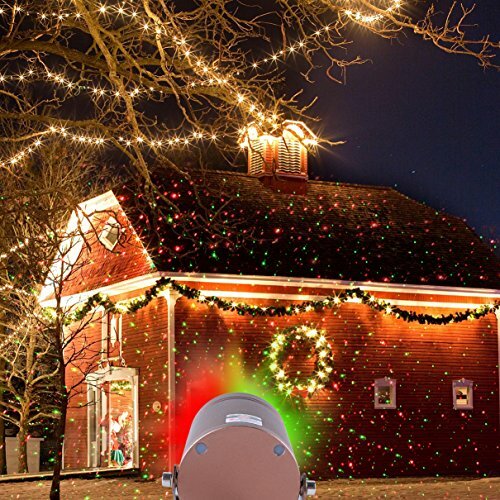 Colorful and merry, the Christmas Laser Light, [Newest Version] Ucharge Snowflake Led Spotlight Landscape Projector put a nice colorful light onto your home and garden on Christmas. The lase spotlight has 10 pcs slides and gives you the chance to choose one of the three modes, with laser lighting up around 5 seconds or so. You may also go for the snowflake that lights up 3 seconds or the laser and snowflake lights up 5 seconds. 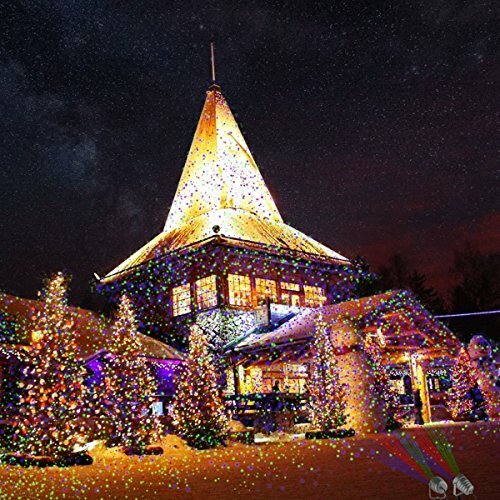 The lights have thousands of dots displaying snowman, snowflakes, stars, and Christmas tree. 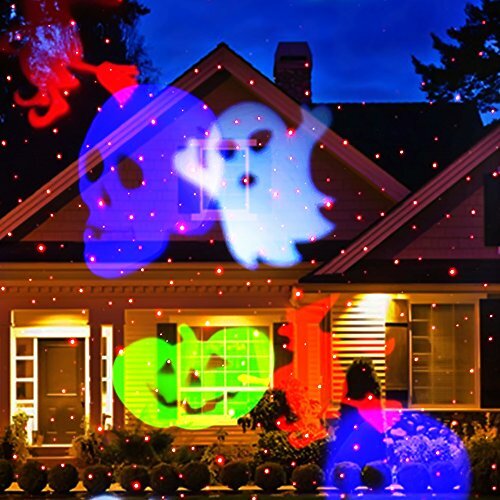 You may use the lights on Halloween also as they display also ghost, pumpkin, and skull. The construction of the lights recommends them for the outdoors and they are waterproof. The built in timer makes the use easy and the lights automatically turn on and off. The moving patterns and the versatility of the lights make them a reliable choice for many occasions, not only for Christmas. 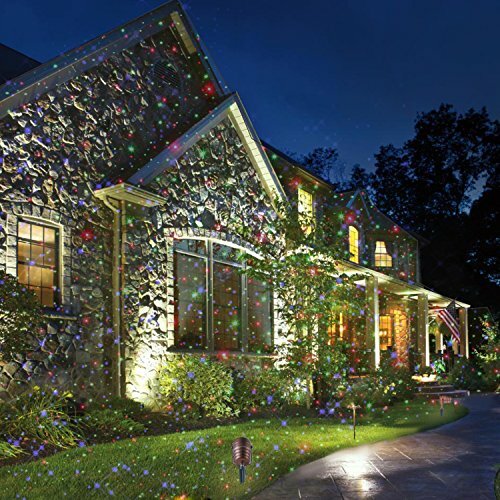 Nevertheless, for the versatility and multiple patterns, these lights are a great option all year round. For those of you who don’t look in their wallet when Christmas shopping, this is a great option for decoration. 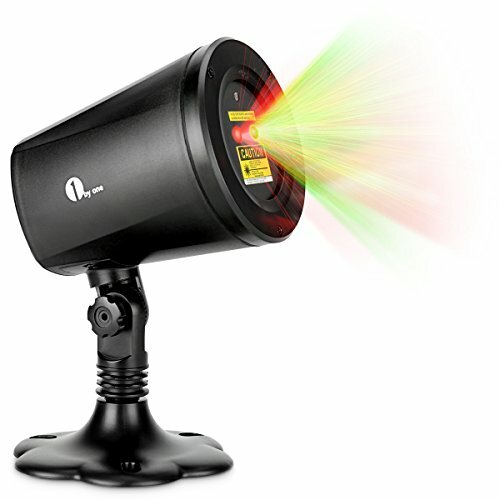 Apart from the price, this projector will impress you with the power of its lights and the combination of colors: single green, single red, single blur. And, if you really want a colorful Christmas, you can go for the combinations of these colors and also change the mode from flash to static, whenever you feel like it. This product comes with a timer and you can set it for 2, 4, 6 or 8 hours cycles. This laser is made of all metal and it’s waterproof. The 25 feet long power cord will let you install it from the corner of the house, from the back, from the front… well, knock yourself out with the possibilities. You’d better read and apply the instructions before plugging it in, so that you enable the remote to sync. 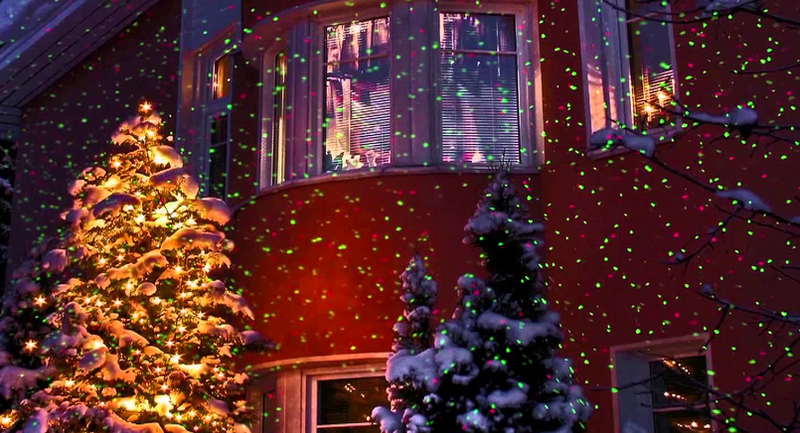 Your Christmas lighting will be easier and brighter with this laser installation. Just give it a try! 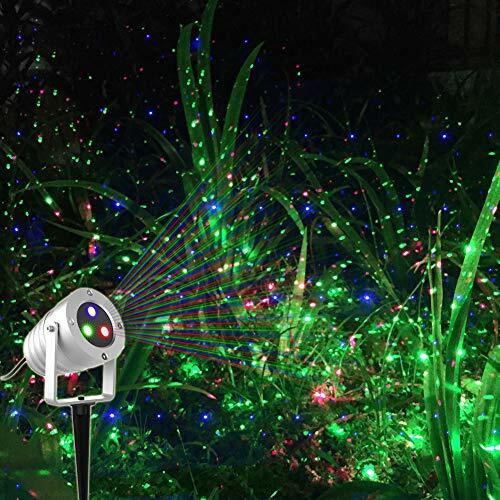 The Motion Pattern Firefly 3 models in 1 Continuous 18 Patterns LEDMALL RGB Outdoor Laser Garden is quite impressive and it offers 3 themes to choose from. 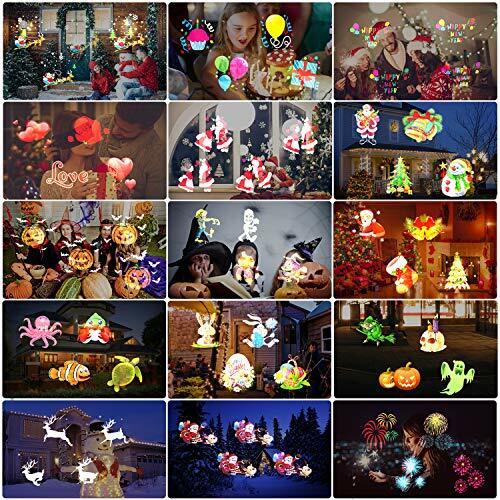 It includes 18 moving holiday patterns for regular situations, but also party patterns themes and all important holidays (Christmas and Halloween). The remote control is easy to choose and you may set the projector on 6 different patterns for each theme. You may also control the speed and the colors. You can set it on green, red, blue or a combination of them. The projectors come with a kit/lock so it stays in put with the setting you like. you may use it both indoor and outdoor as it comes with base stage and outdoor stake extension. It includes a timer setting (2, 4, 6 and 8 hours’ durations), moving and speed control. The auto mode feature is great to use too. The build matches the performance and the projector has a IP67 waterproof grade. The Deluxe Metal housing case looks nice and the 25ft. long power cord ensures flexible use. 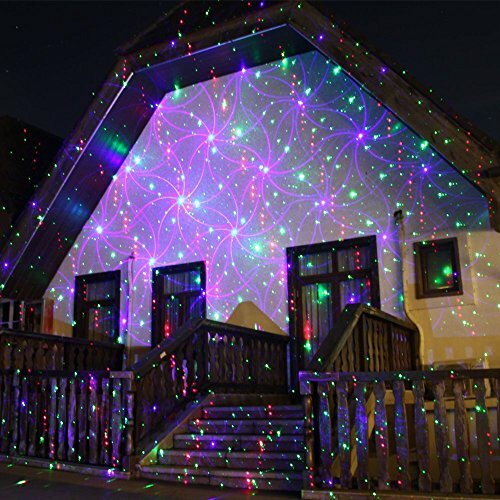 However, as it’s reliable, customizable and ready to take the use for quite some time, the laser projector is a wise investment of your money. When the colorful lights aren’t enough for you to create the magical vibe for Christmas, you’re your money at stake with the Masterpiece City Bluetooth Speaker Music Laser Light. You don’t get to use the lights, but also the music so you’re going to have a nice and jolly feel in your garden this year. You may plat your favorite music at any time, but you don’t need to upload or download any file. You may simply use your phone/tablet to stream some music from your personal library or your no.1 music app. You may use the remote control for setting the playlist and controlling the sound volume. As for the colors, you get to choose from red, green and blue. There are dynamic and cool patters to choose from. In addition, the lights do sync up with the music so it’s not going to be a lovely atmosphere every time. The projector covers 2100sq.ft. and you may control it from 50ft. it’s a great option for a two-story house. The build doesn’t disappoint and the projector comes with an IP65 Waterproof grade. It’s made to handle the temperatures ranging from -40 to 104 F degrees. It works on a rainy day or a very cold one too. The build and design allows you to use it indoor too. The angle is adjustable and you may choose from various speed or color setting. It comes with automatic shut-off and timer options too. 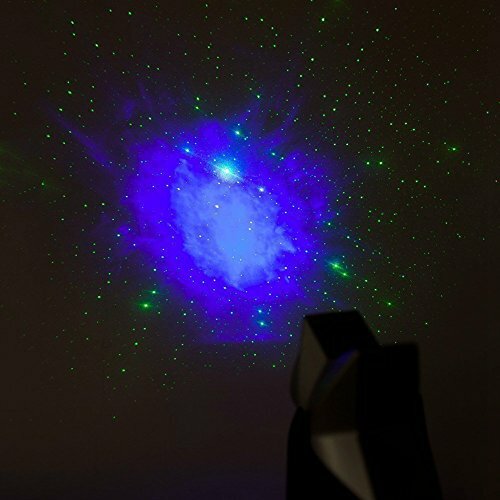 Loaded with useful features, the projector isn’t the one to skip on when shopping for Christmas laser lights. 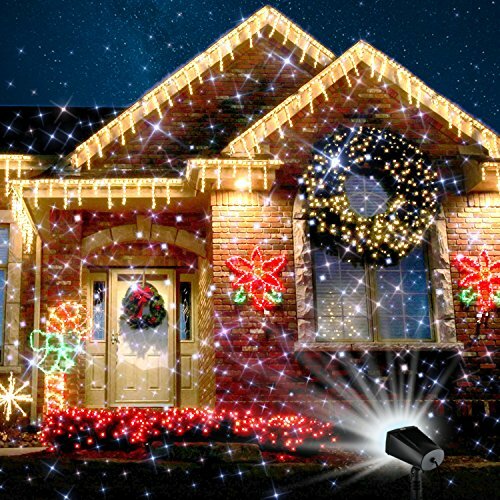 Laser lights are easy to install and to put back in storage once Christmas is over. They give amazing lighting effects and come with so many colorful lights. 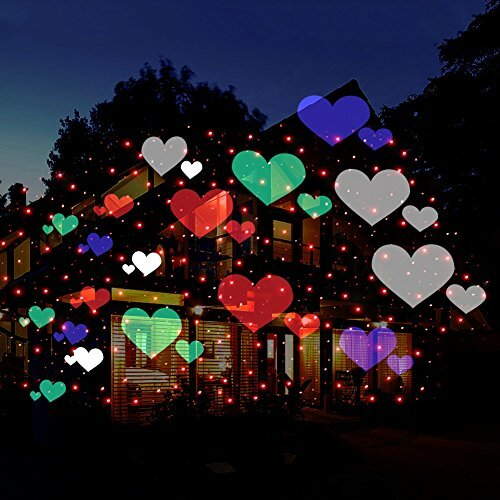 You can get so creative decorating your residence with the laser lights. Unlike the traditional bulbs, laser lights are very safe to use around kids also. They don’t overheat after hours of use and are safe to touch at all time. 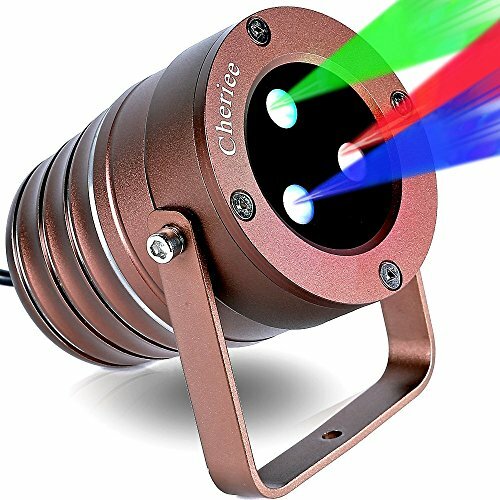 Manufacturers got it why laser lights are so popular nowadays and they’re constantly improving them, adding more features and making them more durable. Laser lights are durable and not only they don’t break that easily, but they also present a high waterproof grade (IP44 at least). They are designed and build to withstand not only a light rain, but also a heavy storm or some snow. In addition, as if it wasn’t enough, many laser lights are sun proof as well, taking intense sunlight. 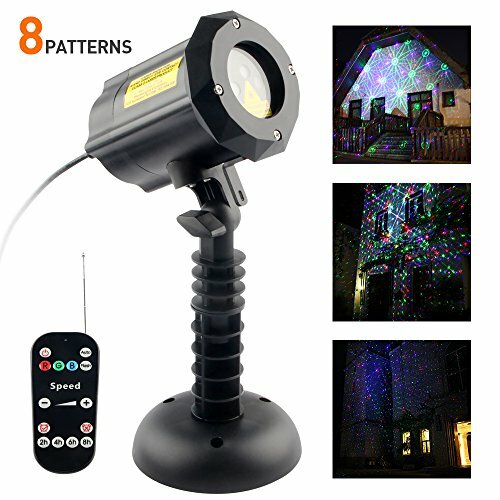 The best thing about laser lights these days are the laser light projectors that take all the qualities of this type of lights to a completely new level. 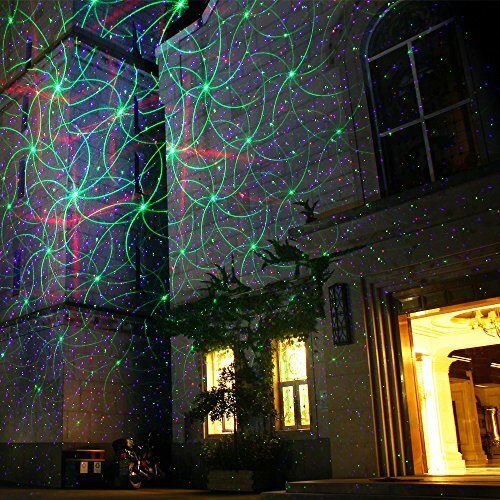 If string laser lights were easy to hang, when it comes to the laser light projectors, you may be blown away. 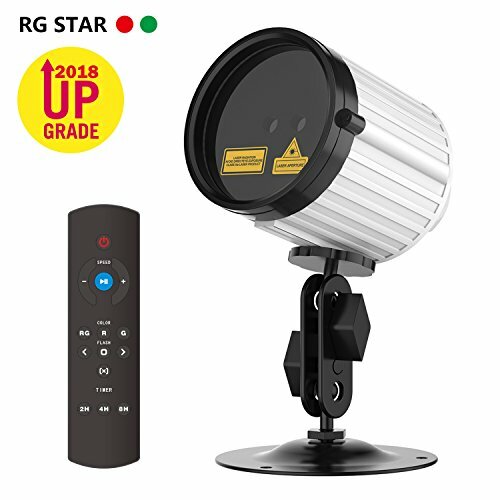 This type of projectors are saving you tons of trouble, effort and time when it comes to decorating your house, inside and outside. Typically, they come with the hardware you need for the installation. That is if you consider a ground stick as hardware. You simply stick the projector into the ground, plug it in and…enjoy the show. 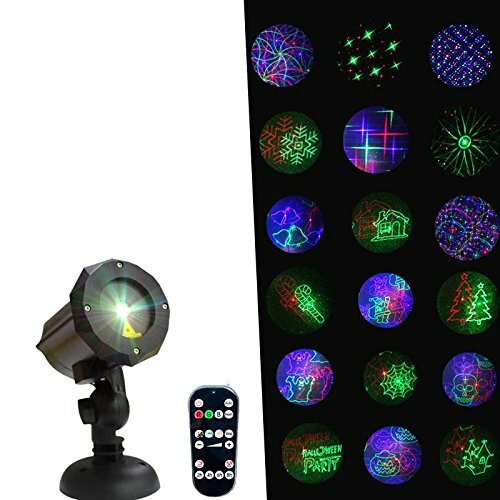 The patterns you may get from the laser light projectors are impressive and you may get models that go for a specific theme, or pay the extra buck for something more sophisticated that is going to save you on any occasion over the year. However, wait, the best this is still ahead. Many laser light projectors out there come with remote control so you may change the modes (static, flashing, moving- your call) from the comfortable couch in your home. Needless to say, many laser lights projectors are waterproof and may be used indoor as well. 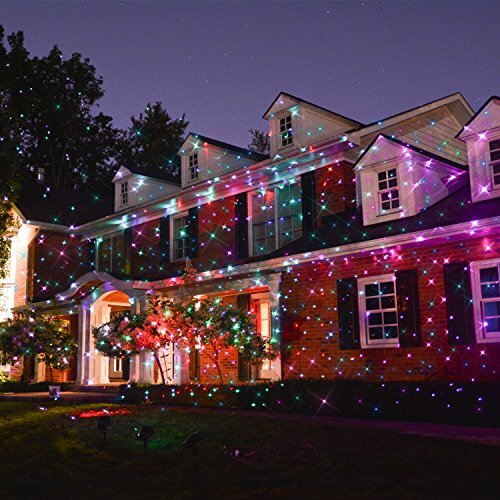 Easy to use, energy efficient and giving amazing lighting effects, all laser lights are a great way to let every neighbor know you’re good to go this Christmas. Or Halloween. Or any other festive day of the year.